I’m a planner. Schedules are my friend, and I’ll admit that I might drive a little faster than I should so I can meet all the demands on my calendar. Last Friday was one of those days when I was trying to make up for lost time. I was on my way to retrieve our daughter from college for mid-term break. Even though a downpour slowed me down, I exited the highway on time and was just minutes from my daughter’s college. Proud of my accomplishment, I took a quick turn and drove through a deep puddle that hid a deeper pothole — sending a huge jolt through my tiny Toyota. Two hours from home, I hoped that nothing had been damaged. But by the time I got to the next stoplight the tire pressure sensor light was on and I heard the sickening sound of a flat tire. Time to panic. Amazingly, there was a tire center just ahead on the left. I pulled in, got out to inspect the damage, and before I could even enter the building, a mechanic came out to help me. He checked the tire to see if it could be repaired. It couldn’t. So, he checked his inventory for the right sized tire. They didn’t have one. However, he did put my spare tire on for free and referred me to another tire store in town. Fifteen minutes after I pulled into the parking lot worried and distraught, I was back on my way to pick up my daughter. That pothole may have slowed me down, but it didn’t keep me from my destination. As I reflected on the event, I discovered a few lessons that can be applied to the potholes in life. 1. Potholes can’t always be avoided. My vision was obscured by rain and the pothole was hidden in a puddle. As much as we like to think that careful planning will help us prevent hitting life’s potholes, we can’t always see what’s right in front of us. When we hit a pothole, our natural reaction is often to look for someone to blame — ourselves or someone else. We try to think through how we could have avoided the pothole that we didn’t see coming. The problem with this type of thinking is that blaming others or beating yourself up won’t help you fix the damage. It’s time to move on, get help if it is needed and learn not to hit that pothole again. 2. When you hit a pothole, help may be closer than you think. One of the spiritual disciplines that I’ve engaged in over the years is the Ignatian practice of “examen.” Essentially it’s the prayerful reflection on your daily experiences to find where God is present and at work in your life. While the help that I received changing my tire came from the kindness of a stranger, I also believe that God was at work through that person. It was a moment of knowing that God was looking out for me and caring for me when I couldn’t see what was coming. 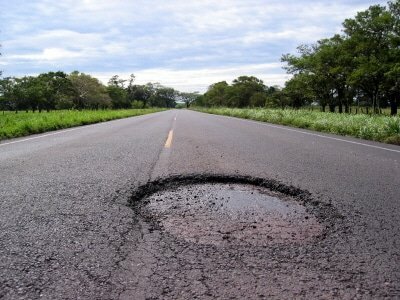 So, before you throw your hands up in the air and give in to anger or depression over hitting a pothole, look for help. You may find that God’s help or encouragement can be found in unexpected places. 3. Attitude is everything when you are dealing with pothole damage. As potholes and flat tires go, my situation really wasn’t as stressful as it could have been. The right people were in the right place at the right time to help me out. I came away feeling pretty positive and peaceful about the “hole” situation. (Sorry, couldn’t resist the pun.) But feeling positive had a lot to do with my attitude. Despite my frustration, I was grateful for so many things. I was grateful for the timing of the flat. (What are the chances that a tire store would be right there?) I was grateful for the help of strangers. And I was grateful that I had the ability to pay for a new tire. The same can be said when we’re dealing with life’s potholes. Attitude is everything. You can always find something to complain about. But if your attitude is optimistic and grateful, you’ll feel much better than when you are complaining. We all encounter potholes in life. But if we look for God’s presence and help, even when things are difficult, we find that God’s words are true. God is our helper. The One who will never leave us or forsake us (Hebrews 13:5). And that is something for which we can be thankful.